What a week for the Irish pony sport! 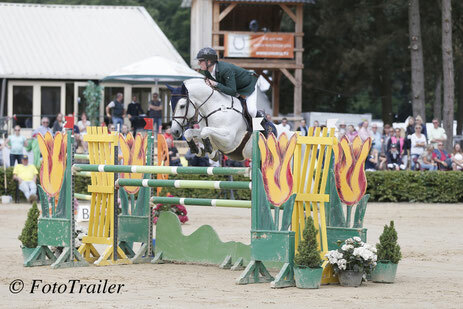 After the victory in the Nations Cup yesterday, Ciaran Nallon from Ireland won the pony Grand Prix. He won with Rexter d'Or. Runner-up was the Irish Abbie Sweetnam with Dynamite Spartacus and 4th Charlotte Houston. In the jump-off with 13 ponies only three jumped another clear round. Third became the Swedish Ingrid Ravik with Attyrory Bye Bye Love. 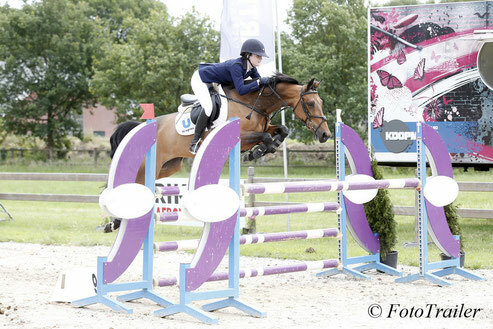 Charlotte Houston (IRL) and Elize van de Mheen (NED) finished 4th and 5th with one fault. One thing was for sure Abbie Sweetnam was not ready yet. After her 2nd place in the Grand Prix, she won the Small Tour ponies with Perseus Spartacus. Her team mate Tom Wachmann became 3rd with Blessington Grange Mist, after Pia Alfert from Germany on Harry. Best Dutch rider was Job Rothstegge on Chermette (Douglas).